You are here: Home » Tibet News » Tibetans being made to worship Chinese leaders? Tibetans being made to worship Chinese leaders? (TibetanReview.net, Jan17’19) – The campaign to Sinicize religion appears to have taken a bizarre turn in eastern Tibet with residents being compelled to replace images of Buddhist deities with that of Chinese President Xi Jinping and other Chinese leaders and compelled to make religious offerings to the atheists’ images. Even the emperors of ancient China, said to enjoy the mandate of heaven, expected only to be kowtowed to, not worshipped like gods. 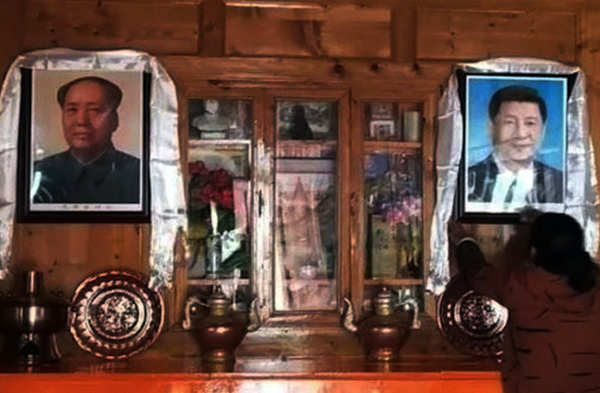 In Serta (Chinese: Seda) County of Sichuan province, Tibetans receiving official “poverty alleviation” subsidies from the government had been ordered to remove images of the Dalai Lama from their homes and to destroy their altars, former Tibetan political prisoner Golok Jigme, who now lives in exile, has been cited as saying. Some families are even being compelled to display images of China’s leader Xi Jinping in their homes, and to prostrate and make offerings, Washington-based International Campaign for Tibet (ICT) cited the monk as saying. ICT cited another source as saying that new housing provided for Tibetans relocated in settlements in what is now part of Sichuan Province had already been equipped with small altars which had images of Chinese party leaders, rather than Buddhist icons. ICT cited yet another Tibetan source, who was stated to have travelled widely in eastern Tibet, as saying some poor families displayed images of Chinese Party leaders in their homes lest the government may cut their subsidies.